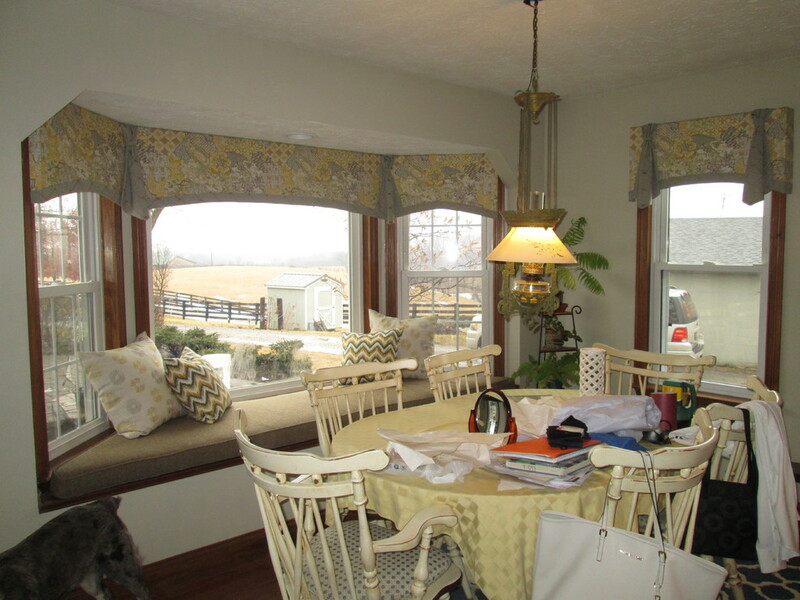 Window treatments with an arched bottom or treatments that have both top and bottom arches. Wide bank of windows with 2 angles. Cornice treatment designed to incorporate angles by using 2 layer pelmets. Decorative wrought iron medallion by Jackie vonToebel used to embellish treatment. Cornice is covered with large pattern floral by Kasmir Fabrics, side drapery panels in deep maroon fabric by Fabricut Fabrics anchors treatment. Rendering provided to customer of proposed window treatments. Wide bank of windows with 2 angles. Cornice treatment designed to incorporate angles by using 2 layer pelmets. Decorative wrought iron medallion by Jackie vonToebel used to embellish treatment. Cornice is covered with large pattern floral by Kasmir Fabrics. Decorative wrought iron medallion by Jackie vonToebel used to embellish 2 layer pelmet. Cornice is covered with large pattern floral by Kasmir Fabrics. 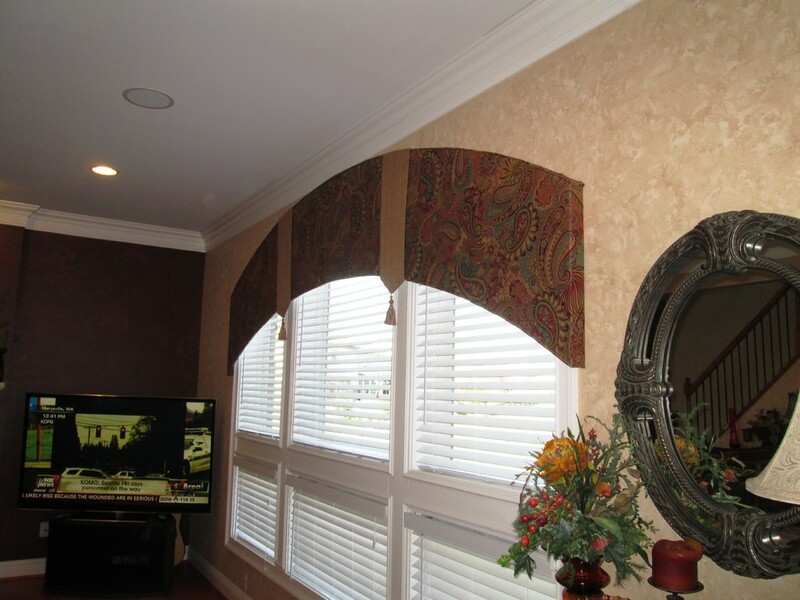 Pair of faux silk drapery panels accenting arched window in master bedroom. Very Large Windows, with lots of sunlight. Not easy to photograph as you can tell by the photo. 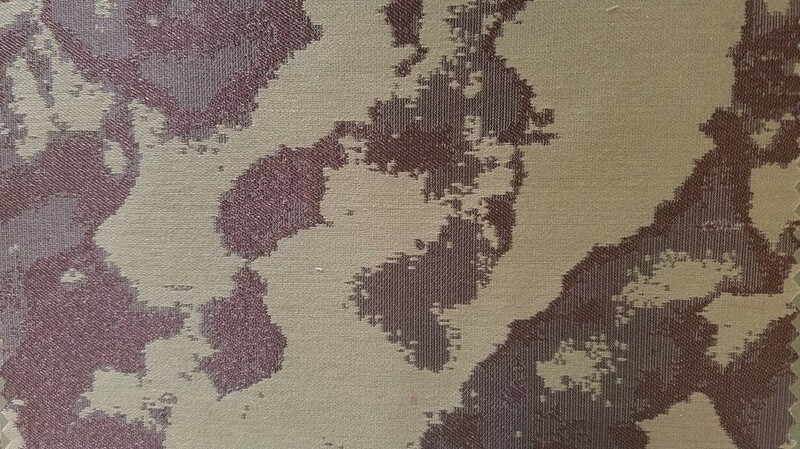 The fabric is a deep, rich purple with shades of grays. Very sporadic color placement with a contemporary flare. Arched swags are gathered from center decorative rod and draped to each side. Gathered cascades with solid purple lining frame the view along the length of the windows. Treatments are lined with blackout lining to provide sun control.